The Odd Couple – Shaun Micallef Online! 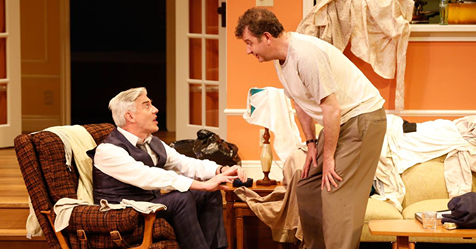 Shaun and long time collaborator Francis Greenslade have long been an odd couple, but for their first time in a starring role onstage together, they will be The Odd Couple. In Neil Simon’s famous 1960’s play, Shaun plays clean-freak Felix and Francis plays the messy Oscar, both of whom have found themselves recently single, living together and depending on each other. With their friends supporting/hindering them and a date with the sisters from next door, can they really last as roommates? Recently Shaun and Francis posed as some other famous odd couples for the Fairfax Spectrum magazine – you can see the hilarious results on the SMH website. This thing is tanking without you Shaun – no not really but having trouble coping with the disappointment- hope is a moral responsibility – that’s on the theatre wall!